My office-mate purchased this graphic novel and said he couldn’t put it down. As he started telling me the plot I became more and more intrigued until I had to read it for myself! David Smith is a struggling artist, who runs into his favorite uncle in a diner. As they talk, he remembers that his uncle died years ago. It turns out that his uncle is Death. David makes a deal with Death and is suddenly able to sculpt any material with his hands as though it were made of clay. The catch? He only has 200 days to live. And in those 200 days, many things go wrong, but some also go right (such as meeting the love of his life). This is a challenge, because this is the first graphic novel I’ve read for adults that is fiction rather than autobiographical. 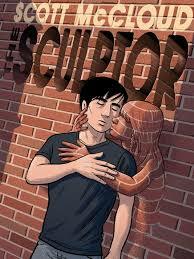 I think you’d enjoy this novel if you are part of the art community or like superhero-type comics. The story did draw me in, but I don’t know that I loved it as much as my coworker did. There were parts that I wish had taken a different path, but there were also some twists that I loved. I didn’t find David’s sculptures as impressive as I wanted to – they were kind of weird. I also think that there were some philosophical underpinnings that I missed and in order to fully grasp the story I would need to read it again. My favorite part was a scene at the end where a person’s life flashes before their eyes. The artwork is stunning, as scenes start slowly and then fly by more and more quickly. It was breathtaking and beautiful. We have several options. It could be A June of Ordinary Murders by Conor Brady, Deep South by Paul Theroux, or All the Stars in the Heavens by Adriana Trigiani. Guess you’ll just have to check back and see!